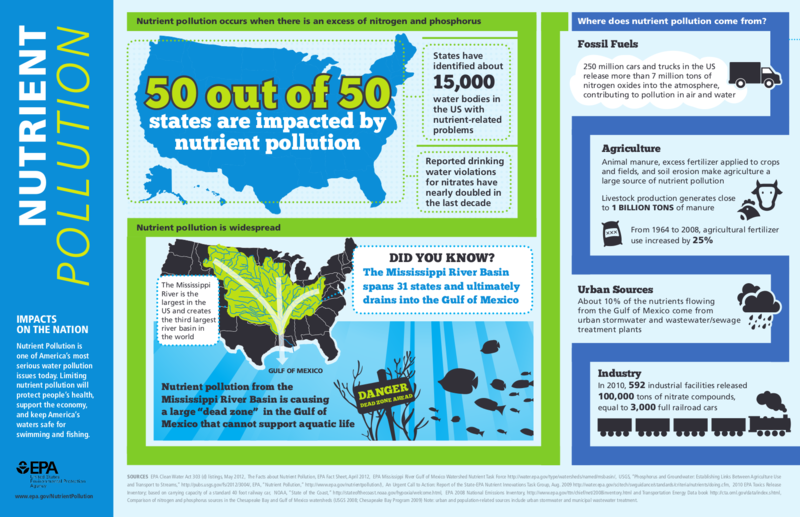 Nitrogen pollution is produced by a number of interlinked compounds, from ammonia to nitrous oxide. While they have both natural and human sources, the latter increased dramatically over the past century as farmers scaled up food production in response to population growth. Once these chemicals are released into the air and water, they contribute to problems that include climate change and "dead zones" in rivers, lakes and coastal areas. To get past this impasse, we looked for approaches that go beyond the farmer. Analyzing past environmental policies, we identified two conditions that increased the chances of success. First, policies tend to be more successful when they target sectors in which a small number of actors control a majority of the market, which makes monitoring and enforcement easier. The U.S. has 2.1 million farms spread over 900 million acres, so regulating nitrogen use at the farm level is not an efficient approach. The 1987 Montreal Protocol, which phased out chlofluorocarbons (CFCs) because they depleted Earth's stratospheric ozone layer, is a good example. Chemical manufacturer DuPont controlled a quarter of global CFC production when the treaty was negotiated, but supported the agreement because it also had patents on at least two generations of CFC alternatives. Instead of forcing more than 200 million drivers to limit their mileage, this approach targets car manufacturers and ensures that the U.S. vehicle fleet becomes more fuel-efficient over time. The Trump administration is currently seeking to freeze CAFE standards instead of implementing an increase negotiated under President Obama, but it is not contesting the basic idea of making manufacturers responsible for vehicle fuel economy. In our most ambitious scenario, we calculated that farmers' fertilizer costs would rise. However, this increase would be more than offset by higher revenue from increased corn yields, leading to total nationwide gains of $300 million by 2030. Industry profits would increase by over $150 million during the same period due to increased sales of more environmentally friendly fertilizers, which generate higher profit margins than traditional fertilizers. And the policy would produce $8 billion in environmental benefits by 2030 due to avoided damage costs from nitrogen pollution, dwarfing the impacts on farmers and industry.